Are you currently in the market for a new SUV? We would like to recommend the 2018 Jeep Renegade. 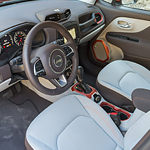 Although there are many SUVs on the market, the Jeep Renegade comes with features that provide drivers with everything from a stylish exterior to impressive capability. Here is a few capability features that come with the 2018 Jeep Renegade. With the 2018 Renegade, you have the option to choose between the standard 1.4L MultiAir Turbo engine and a more powerful 2.4L Tigershark MultiAir 2 engine. The 2.4L Tigershark engine is best-in-class with towing capability at 2,000 pounds. In addition, the 2018 Renegade also comes with body and electrical sealing to keep water at bay. To take the 2018 Jeep Renegade for a test drive, be sure to stop by Leckner Chrysler Dodge Jeep Ram.